Honors program students travel to Omaha, Nebraska with Assistant Dean Tiffany Boselli (left) to meet Warren Buffett (center). You have many opportunities to delve deeper into your academic pursuits through research and real-world applications of what you are learning in the classroom. 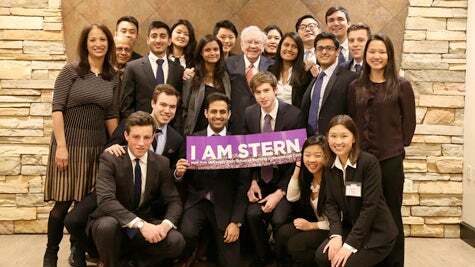 The Stern Program for Undergraduate Research (SPUR) connects students with world-renowned Stern faculty, providing a unique research opportunity outside of the classroom. Practitioner and Experiential Seminars provide students with a connection to the business and not-for-profit world in a classroom setting. The Business Practicum Course (MULT-UB 71) is designed to help students learn leadership and interpersonal skills that will allow them to effectively apply their classroom knowledge to the workplace.